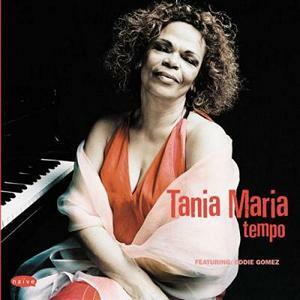 Charmingly intimate, Tania Maria's Tempo is a duo album that finds the pianist/vocalist pairing up with bassist Eddie Gomez for a run through eight beautiful pieces of work. Maria released her debut, Olha Quem Chega, back in 1971 in her birthplace of Brazil. A move to France in the late 70s really allowed her to reach the stratosphere of the international jazz community and she was eventually noticed by Charlie Byrd at an Australian concert. From there, Maria was introduced to the founder of Concord Records, Carl Jefferson, and the action headed to North America. Since then, she has over 25 albums as a leader under her belt and hasn't shown any signs of slowing down. The aughts have been particularly good for Maria, with several albums released, including 2002's Live at the Blue Note. Tempo is the latest in a long string of impeccable recordings. The history lesson proves enlightening because Maria really is at the sum of her experiences here - and ready to blow past them to whatever's next. The recording features a mature and buoyant artist singing song with class and uprightness. She is Brazilian, make no mistake about it, and that energy permeates each piece with uncomplicated zest. Her piano-playing reflects the heritage as well, with notes struck like parts of a percussion line-up. Gomez, a sideman for Bill Evans for a number of years, is no slouch. His presence is distinct but laidback. Tempo opens with "Estate," a piece by Bruno Martino and Bruno Brighetti. Maria's tone is deep and well-worn, lending the standard a sense of weight and thought. Gomez's subtle bass touches serve as kisses on top of an already warming sun. Then there is "Yeah Man," a rolling minor key blues that really shows off Maria's famed ivory chops. The flavours of Brazil are more subtle on this piece, as one would expect, but that makes it all the more compelling as her roots shine through in the slight bounces and off-kilter glides. The samba is strong with the instrumental "Dear Dee Vee," a piece with Brazil written all over it. Her percussive piano technique adds to the fire. Tempo, out now on the French label Naive, is album of uncommon groove and heat. Another gift from a rare breed of performer, this is a jazz recording that is pure Brazilian to the core.